Have you ever left your child somewhere? I expect so. I don’t mean in a Home Alone way (although is it just me or can you see how that easily happens? ); no, I mean have you left them with a relative, or at nursery, school, crèche that sort of thing? It can be hard the first few times (or more), especially if they run after you with tears streaming down their cheeks. But then they learn an important lesson – that mummy does come back later. My youngest recently learnt this lesson, and now I can leave him in a crèche once a week without any tears. I guess that’s an important life skill for a child, because most children do need to be able to cope when mum or dad aren’t there. And so they learn to wait. I don’t mean to sit with their coats on for an hour, longing for me to return (which I think my daughter did for a while when she first started nursery), but to get on with their ‘work’ (play), knowing that I’ll come back for them. They can feel secure where they are, because they know it’s not forever. 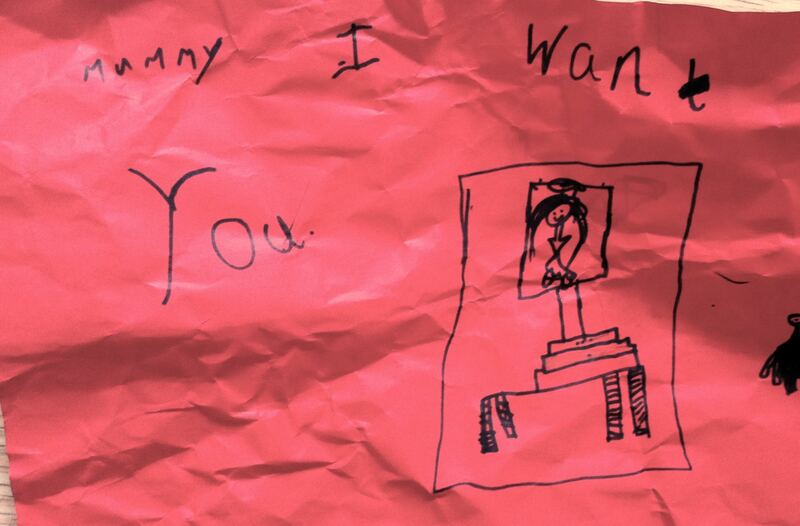 Sometimes my daughter writes me notes (like the one shown above), saying “Mummy I really want you right now,” when something has upset her at school. I hate finding them! But she’s usually over it by the time she sees me, and I hope that when she’s upset, it’s a comfort to know I will come back at the usual time. I’ve written before about learning lessons from my children (Learning to say ‘Thank You’), and I’ve been thinking lately that they can also teach me how to wait. “Do not let your hearts be troubled. You believe in God; believe also in me. My Father’s house has many rooms; if that were not so, would I have told you that I am going there to prepare a place for you? And if I go and prepare a place for you, I will come back and take you to be with me that you also may be where I am. You know the way to the place where I am going.” John 14:1-4. Jesus promises his followers that he has gone to prepare a place for us, and he will come back one day and take us there. My son has accepted this seemingly without a problem. ‘Oh, he’s coming back to get us’ he nonchalantly reminded me one day in the car. And I realised then, that I’m not as reassured by this promise as my 3-year-old son is. Perhaps this is because he is used to waiting for someone to come back and get him. And perhaps because, being a child, he has a child-like trust in God’s promises that I lack. If I believe Jesus is coming back to get me, surely I will have greater peace; joy; perseverance; a sense of urgency in preaching the gospel; motivation to be holy. And when things are really tough, and not just when I’m tired or lonely or discouraged, but when I’m faced with heartbreaking loss or gut-wrenching pain or long-term frustration, I will pray ‘Come, Lord Jesus,’ rather than growing resentful and forgetting that God can see the bigger picture. One of the ways the Spirit helps us is by reminding us of the promise that Jesus will come back soon, and then he will bring us into his perfect Kingdom. Then we will have the answers to all of our questions, and we probably won’t even want to ask them anymore. Jesus, I really want you right now.